I bought this guitar right before Christmas in 1990. Guitar Center had Gibson Explorers and Flying V’s for $350.00. They were also selling Les Paul Studios for $400.00. It was a huge sale! I was surprised the prices were so low for brand new Gibson guitars. The sales manager said they had to blow them out before the New Year. With that in mind I was happy to see if I could find a guitar in their inventory that I liked. I played a Flying V and it didn’t tickle my fancy. I tried a Les Paul Studio, and thought let’s try an Explorer. I tried three or four Explorers until I hit on one that I really liked. I decided to buy the Explorer with the hardshell case for an extra $100.00. I had the guitar set up by a guitar tech that worked at Guitar Center as an independent contractor, and I was ready to rock! The Gibson Explorer just screams Rock ‘n Roll! That is the bottom line on this guitar, and I love it! The stock pickups are high-output ceramic pickups. Perfect for Heavy Metal, but wait I love to play hard rock, classic rock, and some heavy metal but not exactly what people today consider to be “metal” music. The Gibson 496R pickup in the neck position is a great pickup and sounds really good in this guitar. I tried other pickups in the neck position, and I kept going back to the 496R. The 496R is that good, and definitely a keeper. The 500T in the bridge position was not working nearly so well for me. The reason is that I like a pickup that cleans up when I roll back the volume on the guitar. The 500T didn’t really do this, because it is super hot at around 15k d.c. resistance. This pickup kept everything way too distorted for my tastes. I searched a long time and tried several different bridge pickups including a Dimarzio Super II, the bridge pickup from my ’76 SG (which sounded pretty good in this guitar), and a couple others. It wasn’t until I acquired my Les Paul Studio with the 498T in the bridge that I knew I probably found the right pickup for the bridge slot in my Explorer. The 498T is a fairly hot Alnico 5 pickup with a d.c. resistance around 13k, but it does clean up when you roll back the guitar volume. With the guitar volume on 10, the 498T will melt your face when playing into an overdriven amp or into a cranked up distortion pedal feeding a clean amp. The Gibson 498T sells for around $130 new. I decided that was too much money. I knew there was a used guitar shop not too far away, so I went there to find a used 498T. The manager of the store pulls out a couple boxes full of Gibson used pickups. Now to find a 498T… one of the store’s clerks pulls out a multimeter and we start measuring the d.c resistance of each pickup. It took a while but we finally found one that had a d.c. resistance a tad over 12k and was most likely a 498T. I paid the store clerk $50 for the pickup, and I was on my way. I dropped my “new” used Gibson pickup in the bridge position of my Explorer after removing the chrome cover from the pickup to show the black bobbins like the uncovered 496R that was already in the guitar. I could not be happier. This pickup sounds perfect in the Explorer. Nice and powerful with the guitar volume on 10 and when you roll the volume back it cleans up nicely. 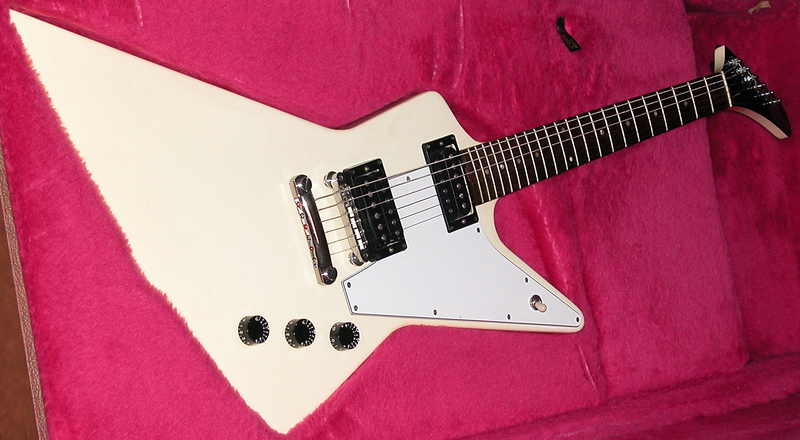 The Gibson Explorer has two volumes and one tone control with a three way pickup selector switch. 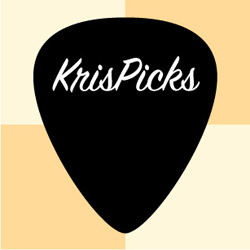 This allows you to be able to do the pickup selector switch stutter/kill switch trick when you have one of the pickup volume controls turned all the way down. The scale length is the typical Gibson 24.75 scale length. The neck is a fast 60’s slim taper style neck with a rosewood fretboard. The fretboard has 22 nice medium sized frets. Not too big, not too small. The paint job was done in Classic White, which has yellowed over the years. Quite typical for white Gibson guitars from my experience. This particular Gibson Explorer is a blast to play and sounds quite nice. It sits very nice in the mix when recording rhythm parts. Leads sound great with this guitar too. There isn’t much not to like about this guitar except maybe the weight. It is a tad on the heavy side. Here is a guitar solo I recorded on my iPad using the Explorer into Positive Grid’s JamUp Pro. Post production was done in Logic Studio 8 on my Mac. All of the parts were played with the Explorer if I recall correctly. I know the lead part was for sure the Explorer. Probably not. It is the only Explorer I have currently.